Cisco's Rowan Trollope unveils the Cisco TelePresence IX5000 series. LOS ANGELES – While customers told Cisco Systems they liked its high end, immersive room-based telepresence solution, it was too expensive to dedicate a room to it and pay for the extensive renovations necessary to support it, from electricity to heating and cooling to even special paint. The vendor has aimed to address those concerns, and hopefully move immersive telepresence out of the executive boardroom and into the conference room, with the launch of its new three-screen Cisco TelePresence IX5000 series at its Collaboration Summit event Monday. According to Trollope, the design principle for the IX5000 was less is more: no room remediation, no HVAC, able to go into any room where it fits. 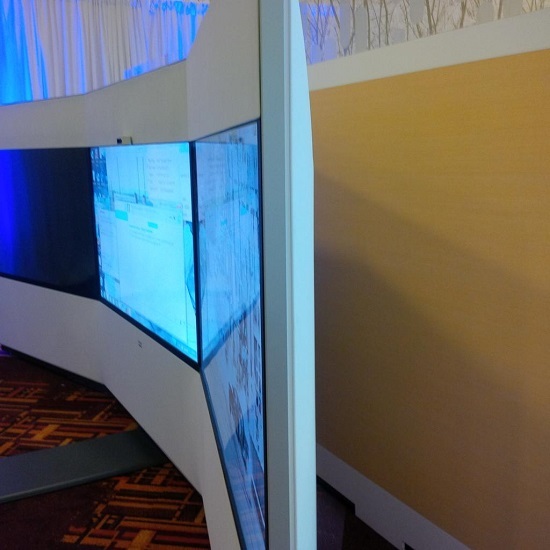 The result is a three-screen freestanding device that is 14 feet long but just eight inches thick, and a table for six to 18 people with 18 integrated microphones that use beam-forming technology to identify the speaker and use the microphone with the best audio. The three 70” screens offer a crisp Full HD experience. The result, according to Trollope, is a solution that requires no room remediation, uses as much power as a hair dryer and, with Cisco’s H.265 codec, uses half the bandwidth of the previous solution. With the use of recyclable plastics and fabric instead of premium metals, the IX500 is also greener than the previous version and weighs half as much. And the install time is half as well. “Our codecs make people look better than all the other codecs,” joked Trollope, adding another innovation was lights over the screen to light the conference participants and make them look better. Automatic, software-based digital zooming with the three 4K cameras also follow the speaker when they stand up, and a configurable white board mode will zoom when they’re writing on a white board. A sideview of the IX5000. Cisco boasts the IX5000 features a lower total cost of ownership by using less power, less bandwith, taking half the install time and requiring no room remediation. It was purposely designed as thin and light to fit in a standard elevator and through doors, two complaints levelled against the previous generation. It has also been designed for usability, with presenters being able to connect wirelessly when WebEx for TelePresence is used. A universal video adapter has also been added. The IX5000 is available now at the same list price as the previous room-based solution, appx. $299,000.